Star Wars: The Force Awakens finally arrived this past weekend! More than three long years after Disney purchased LucasFilm for $4 billion in October 2012, the next chapter in the beloved Star Wars saga has broken box office records left and right. Ever since the sequel was first announced, countless rumors have surfaced, some of which were proven to be true, some false, and some we can't quite determine yet. With that in mind, we've decided to break down the 13 biggest secrets and spoilers that were revealed in Star Wars: The Force Awakens. This should go without saying, but if you didn't see Star Wars: The Force Awakens over the last couple days, there will be HUGE SPOILERS REVEALED below, so read on at your own risk. Star Wars: The Force Awakens is already a hit with the nation's critics, currently sitting at an astounding 95% "Fresh" rating on Rotten Tomatoes, with 241 "Fresh" reviews and just 10 "Rotten" picks. It has already broken box office records by the dozen, with the highest advanced ticket sales in history, and scoring the highest Thursday preview gross in history, with $57 million, shattering Harry Potter and the Deathly Hallows - Part 2's four-year old preview record of $43.5 million. Star Wars: The Force Awakens also became the first movie to make more than $100 million on its opening day ($120.5 million), and broke the opening weekend record with a jaw-dropping $238 million, shattering the record set this summer by Jurassic World ($208.8 million). Star Wars: The Force Awakens introduces three new heroes into the Star Wars universe, John Boyega's Finn, Daisy Ridley's Rey and Oscar Isaac's Poe Dameron, along with Adam Driver's villainous Kylo Ren. Mark Hamill (Luke Skywalker), Harrison Ford (Han Solo) and Carrie Fisher (Leia Organa) are also reprising their iconic roles from the original trilogy. The Star Wars: The Force Awakens supporting cast includes Domhnall Gleeson as General Hux, Lupita Nyong'o as Maz Kanata, Gwendoline Christie as Captain Phasma, Andy Serkis as Supreme Leader Snoke and Max von Sydow as Lor San Tekka. Star Wars: The Force Awakens also marks the first Star Wars movie that George Lucas is not involved in. The franchise creator was expected to serve as some sort of consultant on Star Wars: The Force Awakens, and the sequels that will follow, but he revealed in several interviews that Disney wasn't interested in his ideas, although he revealed earlier this month that he "really liked" the movie. Still, even without George Lucas at the helm, the franchise is in very good hands, with producer Kathleen Kennedy and Star Wars: The Force Awakens director J.J. Abrams, who will serve as producer on the several follow-ups coming in the next few years. Star Wars: The Force Awakens will be followed by the first spinoff, Rogue One: A Star Wars Story, arriving on December 16, 2016. Star Wars: Episode VIII is slated for release on May 26, 2017, with Star Wars Anthology: Han Solo Movie arriving on May 25, 2018 and Star Wars: Episode IX premiering sometime in 2019. Lucasfilm is also developing a Third Star Wars Spin-Off Movie, which is presumably set to arrive in 2020. Josh Trank was initially set to direct, before he left the project earlier this year, and LucasFilm hasn't announced his replacement yet. 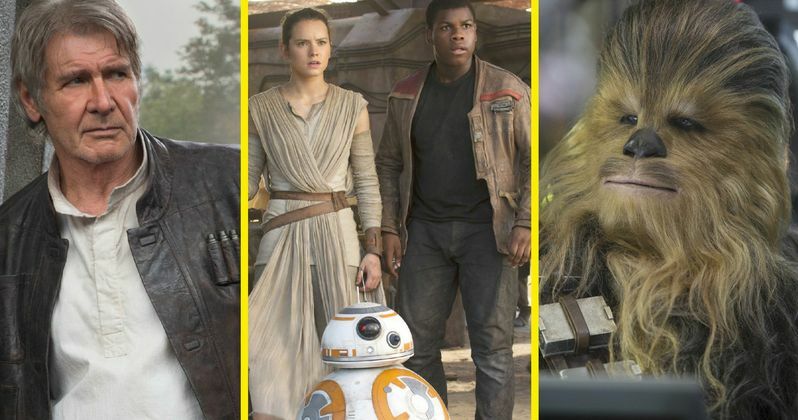 As we look ahead to all of these adventures that will follow Star Wars: The Force Awakens, examining these spoilers and secrets could give us a better idea of what fans may be able to expect in these highly-anticipated follow-ups. Star Wars: Episode VIII director Rian Johnson has already shot some scenes at Skellig Michael Island in Ireland, a key location in Star Wars: The Force Awakens, but principal photography won't begin in earnest until January. While there is very little we know about that new adventure, the secrets and spoilers revealed in Star Wars: The Force Awakens tease that Star Wars: Episode VIII could be even more epic. With that in mind, we present 13 secrets and spoilers revealed in Star Wars: The Force Awakens, and what they could mean for the sci-fi adventures set to follow. This is your absolute last warning for SPOILERS, so if you haven't seen Star Wars: The Force Awakens yet, or if you aren't averse to spoilers, then turn away now and come back after you've seen this epic blockbuster. We begin with possibly the biggest secret of all, that fans have been waiting years and years for. 1 Luke Skywalker Is Finally Revealed! In the three years following LucasFilm's purchase and the announcement of Star Wars: The Force Awakens, Mark Hamill's Luke Skywalker has been shrouded in secrecy, more than any other character in the movie. Over time, we eventually learned some details about key characters, and most of the main players were shown in either the trailers, TV spots, posters and other materials, but Luke Skywalker was still nowhere to be found. Director J.J. Abrams has stated in the past that Luke's exclusion from the marketing materials was done on purpose, and it turns out there was a very good reason for that: we barely see him at all. As many fans guessed, it was, in fact, Luke Skywalker's mechanical hand that is seen being placed on R2-D2, but what we didn't know is that this scene is actually part of a powerful vision that Rey (Daisy Ridley) has, when she first touches Luke Skywalker's lightsaber, given to her by Maz Kanata (Lupita Nyong'o). Still, we don't see Luke in full until the very, very end of the movie, when the holographic map to Luke Skywalker is finally complete, after the First Order is defeated. The film ends with Rey finally tracking down Luke Skywalker, to return his lightsaber as we finally get to see the bearded, exiled Jedi for the first time in 32 years. It's an incredible, and important moment, that sets the stage for Star Wars: Episode VIII. In fact, Luke's lair of exile was shot on Skellig Michael Island, which is where the first scenes of Star Wars: Episode VIII were shot this fall. One can only hope we see much more of Luke in that adventure, set for release in 2017.